The phrase "heavy duty" gets thrown around a lot these days when describing utility vehicles, but few SUVs can really live up to the claim. The 2015 Nissan Armada SUV in Peoria is one of those few, packing powerful performance and capability into a completely refined driving experience. Built for hauling people and cargo in unmatched comfort with unparalleled control, this high-endurance, trailer-friendly powerhouse of a vehicle is ready and willing to take on any adventure. Read on as our 2015 Nissan Armada review continues below to see why it ranks above the competition. Built around Nissan's 317-horsepower, 5.6-Liter V8 engine, the new 2015 Armada commands attention both on the flats and the hills. Available in both FWD and 4WD options for customized capability, this deluxe 5-speed automatic transmission SUV can tow up to 6,500 pounds standard, and haul up to 8 passengers in comfort and safety.� Add the Platinum Tow Package and that tow capacity reaches 9,000 pounds. With a well-balanced frame design and sequential MPI fuel system, the 2015 Nissan Armada maximizes fuel economy for its size, garnering an EPA-estimated 19 MPG highway. With its stately 28 gallon fuel tank, the 2015 Armada can cruise well-over 400 miles between fill-ups. Add the all-mode 4WD, this SUV has the power, the stability and the capability to get you wherever the road may take you. 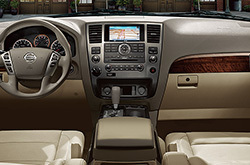 An array of safety features built into the 2015 Armada allow for ultimate control in the city or on the open highways, with Vehicle Dynamic Control (VDC) and Electronic Brake-force Distribution increasing stability, and the Active Brake Limited Slip differential sensing wheelspin, this intelligently designed SUV keeps you grounded no matter the environment. 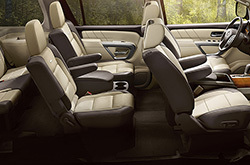 The 2015 Nissan Armada in Peoria is a full-size SUV designed for a full-sized life. Strapped with the safety features to keep you and your passengers safe, and packed with the power to keep your inner-engine satisfied, you can't find a more invigorating and pleasing ride on the market. Continue reading our 2015 Nissan Armada review below for further details, specs and comparisons. When you compare Nissan's new 2015 Armada head-to-head with the 2015 Buick Enclave, Ford Expedition and the Toyota Sequoia, we're sure you'll see that the Armada is right for you. The Armada's modern cabin amenities and budget-friendly pricing are just a few of the winning qualities that shoppers will be thankful for. Hundreds of Phoenix Nissan drivers choose it because it's a spectacular value; just compare its price to the vehicle options listed above. For more info about its specs, check out the Armada's quick-facts list underneath this text. 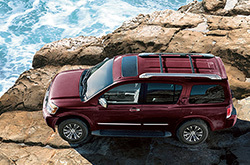 The 2015 Nissan Armada review above was penned by Peoria Nissan's knowledgeable writers; for information about preceding models please view the links in the sidebar. We take our mission to provide the best reviews created by automotive experts - it's just one more thing that makes us a chief Nissan dealership in Phoenix. The above article is loaded with important information - it contains info about fuel economy and other specs so that you can make educated decisions about the Nissan you want to buy. After reading through Peoria Nissan's review of the new Armada, contact us to make an appointment for a test drive and find out about current lease offers!